This nautical-themed key chain is both adorable and functional, featuring a brass and copper diving helmet key fob. Crafted from solid brass and copper, this key chain is as beautiful as it is durable and functional. A knurled knob allows you to easily and securely add or remove keys from the ring. These wonderful key chains make ideal gifts for friends, family, employees, clients, co-workers and especially yourself. Beautifully reproduced in these nautical keychains, these classic diving helmets will delight the most avid sea-faring enthusiast with their nostalgic charm. 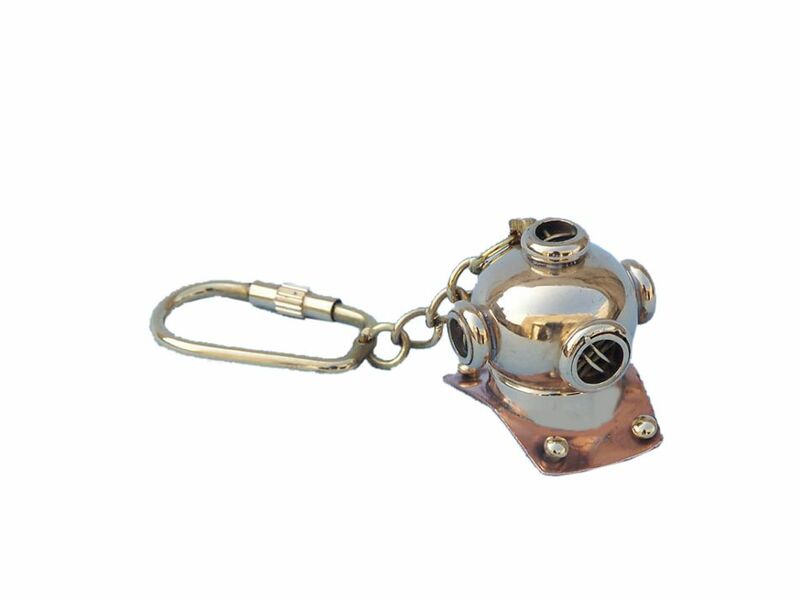 Bringing to mind the dedication and bravery of Naval and civilian divers alike, these brass keyrings display a model used since before the First World War. 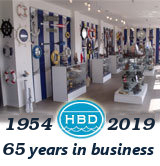 First tested around the early 1800s, the diving helmet was originally an open design, with air piped through a hose or attached to a tank, and trapped in the bell. These, however, proved to be unreliable as the slightest imbalance in pressure or inversion would cause them to flood. Showing a more modern design, with a closed helmet that bolted onto a suit, the helmets on these brass keyrings signal the beginning of contemporary diving. At the turn of the 19th century diving truly became an art, particularly in the Navy where programs were implemented to push the boundaries of what was thought possible. The diving helmet design of these nautical keychains is one of the enduring symbols of the ocean, evocative of brave men risking their lives in a frontier that had been little explored. From Pearl Harbor to Hollywood, the diving helmet has leapt into our collective consciousness, all the way to this fabulous brass keyring. Perfect as a historical gift, or perhaps for the diver in your family, these diving helmet nautical keychains will take your breathe away.